Biking total: 98 days, 4628 km, 27’000 altimeters. Climbing total: 252 days, 3401 km, 127’400 altimeters. 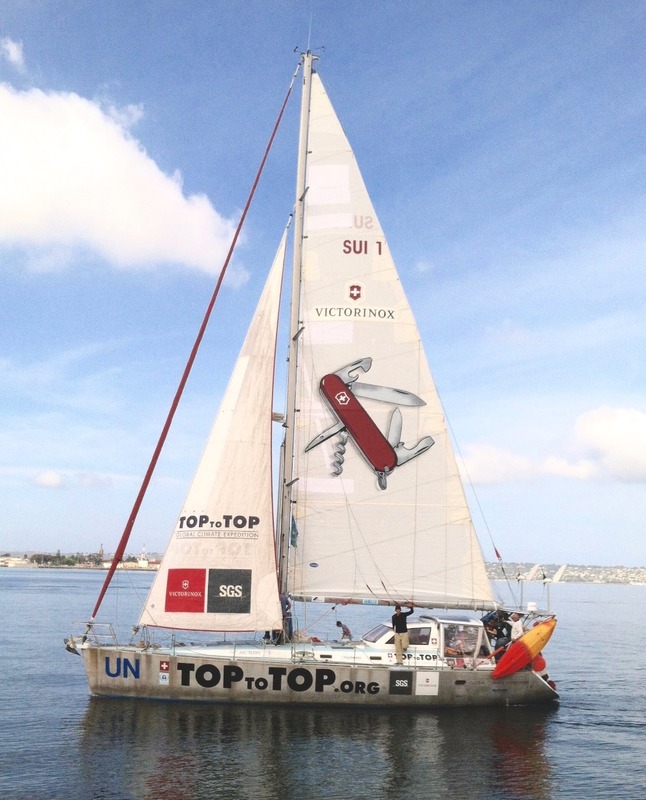 TOP of the TOP – we will get a new crew! Our member Thierry Schmitter got the Bronze Medal at the Paralympics in Athens with sailing. Queen Beatrice welcome Thierry in her palace! Clean up 300 kg on Aconcagua, highest peak of America and the Western hemisphere; – climbed on the 30th of November 2004 from sea level to the very TOP with human power only! TOPtoTOP reached the second TOP of the 7-Summits non-stop round-the-world expedition at 13 h. Aconcagua is with 6962 m the second highest mountain after Mount Everest on this first 7-Summits expedition using just human powered means: climbing, biking and sailing. We biked 1294 km from Valdivia (Northern Patagonia) to Puente de Inca at the base of Aconcagua (see also last report). To leave Santiago was not easy: The main roads were blocked because of the visit of president Bush (APEC). From Santiago we got to Los Andes where we met Gregoria on the market. Soon after, we were invited in her house and cooked the Swiss meal plain-in-pignia for the whole family Saavedra. An avalanche blocked the road over the Andes for several days. We were just in time and had to wait only one day till the Portillo pass was open again. Unfortunately it produced a lot of traffic on this main connection between Chile and Argentina. It was a hard climb with endless turns and over 3000 altimeters. Ursula Spoerri, Christian Sonderegger, Paul Degonda, Erwin Graf, Vitus Walder, Claudio Canova, Ernst Naef, Patrick Furger und Reto Casutt. From Puente de Inca we reached in 3 days Plaza de Mulas, the base camp in the Horcones Valley. Sabine went back to Santiago because our new crew in her stomach does not like 6962 m yet. The days before we got to the base camp on 4370 m it was 35 degrees Celsius with snow and a lot of wind. The 27th of November was a black day for our member Vitus: During the night from the 26th to the 27th of November the blood oxygen of Vitus fall down to 34 percent. Claudio, our doctor has done a very good job till the morning! Dario Saua, the official doctor in the camp organized together with the Park rangers a very efficient rescue by helicopter to the next hospital. I joined Vitus, contacted the Swiss Embassy and made sure that everything went smooth. Together with Claudio Canova, I climbed Aconcagua in 3 days (55 h) from Puente de Inca (reached by bike from Valdivia) over Plaza de Mulas and Camp Nido. Only 6 climbers reached the TOP this November. We were number 3 and 4! Many expeditions were not successful because of strong winds and bad weather conditions. May a cause of EL Nino – a disruption of the ocean-atmosphere system in the Tropical Pacific having important consequences for weather and climate around the globe? – By the way: This climb might be also the first time from sea to the TOP by human power only! After we toped the highest peak of America we started to clean up this giant and collected a total of 300 kg of rubbish! An idea for other expeditions: We had a lot of good food left on base camp. We took it down and will distribute it in the slums of Santiago the following days. – the German Ambassador Joachim Schmillen that we can stay at his place in Santiago! – the Swiss Consul Jean-Didier Javet for the TOPtoTOP-Aconcagua welcome party tomorrow! – the hotel Rugendas for the hospitality for the TOPtoTOP-crew and the offer to use their Internet facilities! Tip for young people: Season kickoff for free – posted by our member Juerg Biner, Zermatt! Congradulations! Fantastic news. A great gift from Pachamama! What next? Date for Australia is Jan 26th. all the best for you and the child. Congratulation for climbing Aconcagua and cleaning it. Have a good Christmas and all the best for the New Year.